Bowen Park has the longest history of any venue and course on Vancouver Island. In January of 2004 we hosted the first ever cx race north of Victoria in preparations for Wendy Simm’s first trip to CX World Championships. It was won by Robin Dutton. In November of 2004 we hosted the first ever official and insured cx race on Vancouver Island in Beban park. The course started and finished on an old stock car track that still existed in Beban park at the time called the Grandview Bowl. It was an amazing facility for cycling at the time. The race was actually quite well attended. The winner of the main events were Wendy Simms and Andrew Pinfold who went on to race for a number of road teams including Symetrics. In 2005 Beban park hosted the last race of the first ever Provincial Cyclocross series (which we started). In 2006 Beban Park hosted the Canadian Cyclocross Championships. The only Canadian Championships (Non track and non-masters) to be held on Vancouver Island (not 100% on that stat but I think it might be true?). Since 2006 Beban has been used almost ever single year of Cross on the Rock with the exception of 2 making it the longest standing and most used Cyclocross venue on Vancouver Island and in BC. Parking: Beban park is HUGE. But on any given weekend there is a LOT going on. The best place to park for the race is south of the registration in the gravel lot by the golf course and tennis courts. Be aware that there is a new road access to the Steve Smith Jump park, please do not block it. IF there is no soccer on the Beban fields then that lot will also be available. The lot by the BMX track is normally under-utilized. The paved parking by the Pool and arena might be over run so it would be best to avoid those lots. Parking on the roadways or grass is strictly forbidden and will get you towed. Team Tents: Make 100% sure your tent is staked and secured. With wind this week and in the forecast we can not have any tents becoming kites. There will be quite a bit of space for team tents (No vehicles) as marked out on the attached map. It is drop and go until we close and lock the gates around 10am. After that point you will have to carry your gear in. On the flip side the gate will be LOCKED until after the expert race so it will be carry out until that point. There will be no team vehicles inside the gate or we will run out of space for the team tents. Registration: (Almost) Mandatory pre-registration will close like normal at 5:00pm the night before the race. In this case that will be SATURDAY NIGHT at 5:00pm. Reminder that if you choose to not pre-register you will not receive a call up. No exceptions. The call up sheets are literally done by 5:10pm the night before the race. The link to register is here. On Sunday number pick up/license check/check in (and Tycho and Tessa’s special stand) will be located in the small red barn (refer to map). Same location we have had it in past years. Washrooms: There are LOTS of washrooms located in Beban park. EXCEPT in the area where the race is held. The washrooms that we have used in the past that are located in the VIEX grounds are now de-funct. We will have two Port-a-potties in the corner of the gravel parking near the Team Tent area. You can also locate washrooms in almost all buildings in the park. Both arenas. Down by the artificial turf field. In the Pool. NO DIRTY BIKE SHOES OR DIRTY PEOPLE INSIDE THE BUILDINGS OR WASHROOMS. Clean yourself up BEFORE going into a public area. We want to be able to use this venue again. Awards: Awards location will be posted at registration. The small red barn will be too small for this year and weather will play a part so we will post this on race day. Race Course: Things are coming together for Sunday’s race. Both the weather and the course will be similar to last year’s event but with a few notable changes. With this year’s construction of the Steve Smith Bike new road access. We will make it up though. Expect a mud fest and challenging (long) course. MIVA will use all of the available barriers and every ounce of terrain to ramp up technical aspect. Food: AJ’s Island Grill Food Truck will be on-site and ready to serve upBreakfast and Lunch. Great coffee, Gourmet burgers, wraps and all sort of deliciousnesses. This year we have also invited Georgies Pies etc. to bring her home baked wares. Post race: We will want to get the awards going as soon as possible on Sunday. With that in mind please help us both tear down as well as RAKE out the course. With the rain in the forecast the more raking we can do the better the course will look on Monday when people are driving by or walking through. Please bring a rake and work gloves. Many hands make light work and get the work done FAST. We will make an announcement when we are starting the awards….and…..well…..there will be no one left on course so you will notice that the awards have started! 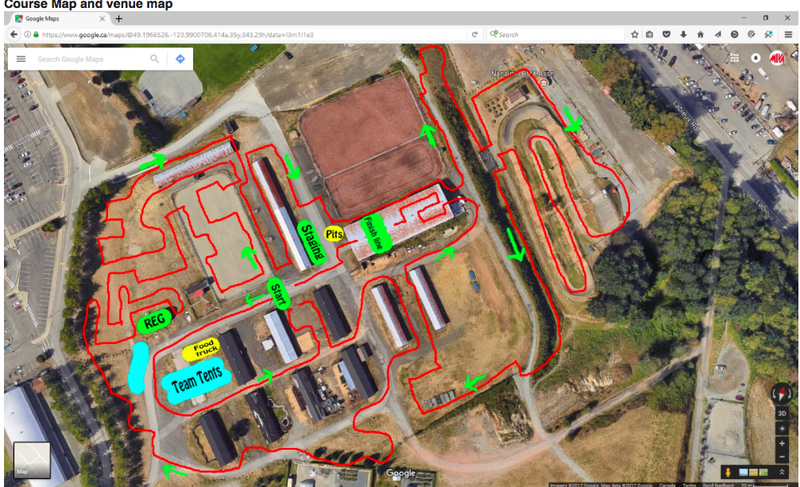 Considering there will be some adjustments and tweaks….but here is a GENERAL outline for the course and venue for Hot Crossed Bunnies.